My Mothers’ Day celebrations started out on Saturday night. Benzo and I met up with Movie Mom and my brother at the Olive Garden. We had a lovely dinner. I gave my mom a pretty flowering plant and my brother gave me a “soon-to-be mom” card, which was sweet of him. It had been awhile since we were all together so it was really nice to get to spend time with both my mom and my brother at the same time. I’ve made the egg & sausage casserole several times. 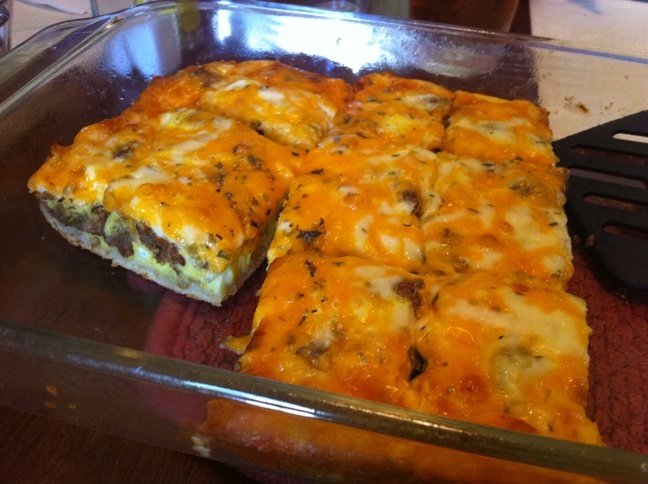 It’s extremely tasty and is a very easy dish to make for breakfast or brunch. I made part of it with vegetarian sausage for me and the rest as the recipe directs, except I like to use thyme in my eggs rather than oregano. 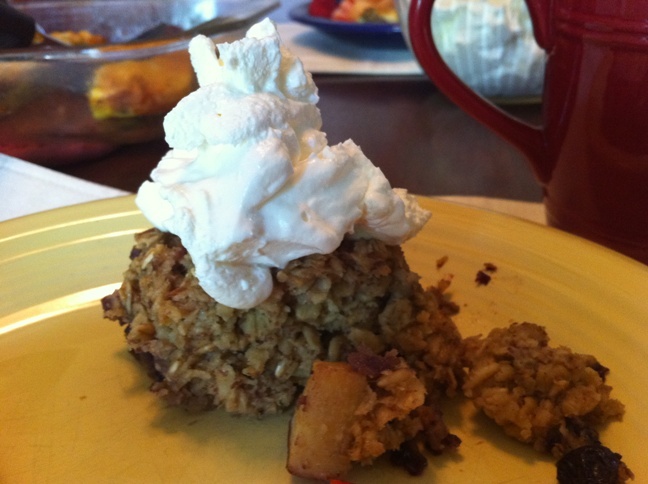 The blueberry baked oatmeal was a new recipe I tried last Saturday morning. I woke up early and couldn’t go back to sleep so I got up and decided to cook breakfast. It had thunderstormed the night before so I was in the mood for something warm and comforting. Baked oatmeal fit the bill. I’ve made baked oatmeal before with cranberries and walnuts, but wanted something different this time. I stumbled upon this recipe that included blueberries and decided to try it. 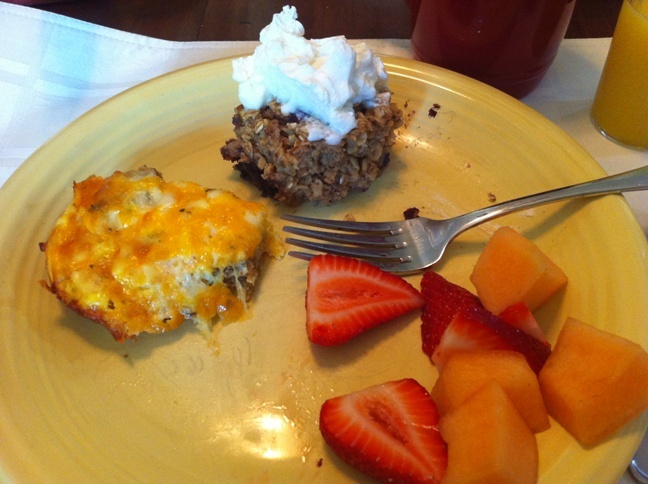 Benzo and I liked it so much that I made it again on Sunday morning for our Mothers’ Day breakfast. Fold cool whip and yogurt together. Serve with fruit, on top of oatmeal or layer into a parfait. After breakfast Benzo and I went to church. We hung out with some friends for a little bit afterwards and then headed out to the zoo. The zoo was giving free admission to all moms and free ice cream cones! Everyone else only had to pay $1 for an ice cream cone so it was still a good deal. It was pretty hot and very busy, but I hung in there as we walked around for hours. I’ll walk this baby right on out! Benzo tracked our route with a GPS app on his phone and we ended up walking over 4 miles total. By the time we got home we were both totally beat and I couldn’t do anything except veg the rest of the night. It was nice though to rest after all that activity during the day. Benzo surprised me with a cute elephant stuffed animal that he bought from the gift shop while I was in the restroom. It’s a mom elephant with a baby elephant attached. So cute! Our nursery is a jungle/safari theme so it’s perfect. All in all I had a great Mothers’ Day weekend. I hope everyone else did too!